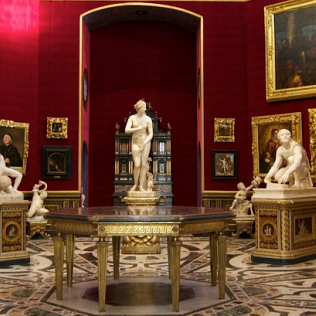 The Uffizi has a remarkable collection of ancient marble sculptures. Nowadays we can admire these white figures in the corridors and in the rooms of the gallery. However, originally these artworks had a very different aspect: they were very coloured. In the last part of the 18th century, these sculptures still displayed part of their original polychromy, but, at that time, art experts thought that the polychromy was a later addition and that it spoiled the original whiteness of Greek and Roman art. In this period important interventions with acids took place and they deleted the last traces of colour, giving sculptures their white aspect. During the last years, the Uffizi Gallery, in cooperation with the Dipartimento di Chimica of the University di Modena e Reggio, has tried – with some well-advanced instruments – to find the remains of the polychromy, that today we can’t see naked-eye. Results have been amazing, and the next step will be to show the graphic representation of the original aspect of these sculptures to a large public. What has been found? Using an optical microscope and the x rays, researchers have observed precious kind of colouring, made of lapis lazuli and gold flakes, in addition to many others. The most important discoveries concern the Medici Venus, that is probably the most loved – by public and art historians – Uffizi sculpture. During its restoration, in 2012, some large parts of gold leafs – that covered the goddess’ hair – were found. The Venus has been in the Tribune for many centuries. However, during the Napoleonic occupation, the sculpture was brought to Paris, where it remained for 12 years. When it came back to Italy, a too much invasive restoration, deleted the golden hair: it seems that it was considered – still in the 17th century – a proof of the quality of the artwork. The Venus had also red lips and pierced ears: it wore earrings! We can understand that it was a very different and more realistic sculpture than today. Thanks to science instruments we can reconstruct what history has deleted, and admire what still remains.